Please be sure to choose your current version and edition properly. Please download and install the program, and use the code to register it. After that please run the Translation Office 3000 Database Converter ("C:\Program Files (x86)\AIT\Translation Office 3000 Version 3D\Admin\DBConverter\TO3000_3DConverter.exe" by default). (the default location is "C:\Users\Public\Documents\AIT\TO3000, Version 10 (or 11)\db\TO3000.fdb", but the path may differ). Please check the SQL server button (in most cases there will be only one server, you need the one called "(LocalDb)\MSSqlLocalDB (<your computer name>)"). 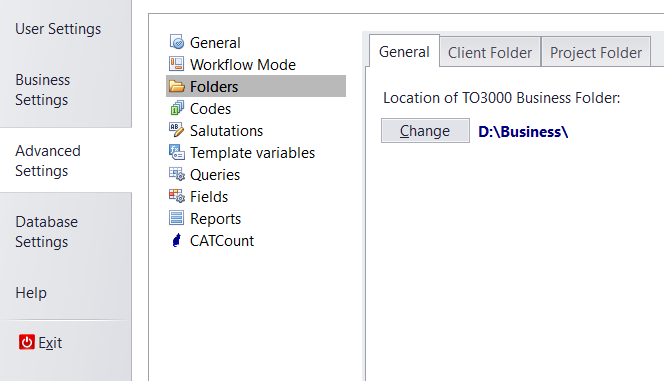 On the next step please check the "Overwrite existing TO30003D database. Existing data will be lost." option and start import. Next time Translation Office 3000 3D will run with your database. In case you'd like to use your old document templates, please copy the "C:\Users\Public\Documents\AIT\TO3000, Version 11\Templates" folder contents into the "C:\Users\Public\Documents\AIT\TO3000, Version 3D\Templates" folder. You can copy your CAT schemes from "C:\Users\Public\Documents\AIT\TO3000, Version 11\CatCount\Schemes" to "C:\Users\Public\Documents\AIT\TO3000, Version 3D\CATCount 4\Schemes"
You can also copy your Business folder and all the documents in it to the new machine. Make sure that the the program points to the folder's new location in "Advanced Settings >> Folders >> General". NOTE: Filter settings cannot be copied from old versions.